This is the home index page of Megaliths.net. There is also a Site Map with clickable world map of megalithic locations and a book about the megaliths (see left). See also our newly founded forum LexiLine at ProBoards as well as the predecessor LexiLine Newsletter/Group (569 members as of October 20, 2016) and our founded Archaeology Travel Photos group at Flickr (2411 members and 52700 photographs as of October 20, 2016). See also our founded Megalithic Sites of the World at Flickr (630 members and 6700 photographs as of October 20, 2016). We have new decipherments relating to Stonehenge and Avebury at our Ancient World Blog. Take a look now. It will be a while until we can move them properly to this website. We are talking about a lot of material. The author of this website during college days worked on a land survey team for the Nebraska State Surveyor's Office in Lincoln, Nebraska, USA. That "Nebraska connection" is deepened in the next paragraph, showing how land survey is connected to a study of the megaliths. 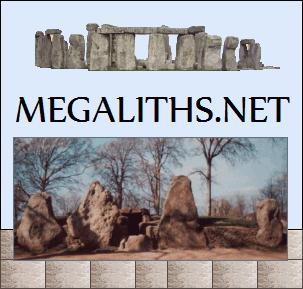 Megaliths.net is a systematic graphic-supported analysis of megaliths and megalithic sites around the world which shows that ancient megalithic sites are land survey sites located by prehistoric astronomy. As observed by Alice Cunningham Fletcher (Alice C. Fletcher) in her 1902 publication in the American Anthropologist, there is ample evidence that some ancient cultures, e.g. the Pawnee in Nebraska, geographically located their villages according to patterns seen in stars of the heavens. FLETCHER, A. C. (1902), STAR CULT AMONG THE PAWNEE —A PRELIMINARY REPORT. American Anthropologist, 4: 730–736. doi: 10.1525/aa.1902.4.4.02a00050. "Alice Cunningham Fletcher and Chief Joseph at the Nez Percé Lapwai Reservation in Idaho, where Fletcher arrived in 1889 to implement the Dawes Act. The man on one knee is James Stuart, Alice Fletcher's interpreter. According to Jane Gay in "With the Nez Perces" (University of Nebraska Press, 1981), Stuart customarily kneeled in this way when he felt anxious. Photograph by Jane Gay. (Courtesy Smithsonian Institution, National Anthropological Archives [MS4558]. Images from the National Anthropological Archives may not be reproduced without permission.)" The Smithsonian image is, however, in the public domain. 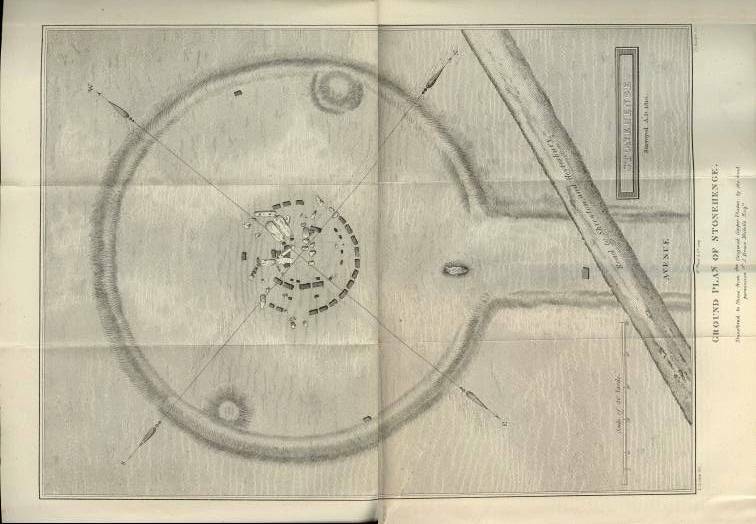 The image above is my scan of an original survey map of Stonehenge as found glued to the inside margin of page 55 of William Long's book, Stonehenge and its Barrows, published in Devizes in 1876 from the Wiltshire Archaeological and Natural History Magazine, vol. xvi, Wiltshire Archaeological and Natural History Society. That book is still the best book ever published on Stonehenge, except for Gerald S. Hawkins, Stonehenge Decoded. The Pawnee Star System was applied hermetically on Earth i.e. "As Above, so Below" and Fletcher's drawings show without any doubt that this same system was quite obviously used in the oldest constructions at famous locations such as Avebury, Knowth and Stonehenge, whose clear astronomical nature is still disputed by scholars lacking knowledge. Mainstream scholars alleging that those constructions are not clearly astronomical have not done their homework. not only in the United States but around the world.... It was. We have applied the "Pawnee" hermetic astronomical principle, "as above, so below" to megalithic sites around the world, for example, to the Malta Temples, and have achieved remarkable results. We suggest that many megaliths and megalithic sites served as boundary stones and landmarks sighted (and sited) by astronomy. Included here are also petroglyphs (ancient rock drawing sites) which we think are often astronomically oriented (e.g. Kilmartin, Scotland or Tanum, Sweden -- see below). The same is true of the locations and subjects of prehistoric art in cave paintings. As an example, the Lascaux Cave in France is located at 45 degrees North and its paintings are clearly subject to astronomical interpretation. Archaeologists seem to have little interest in or knowledge about ancient land survey systems or ancient astronomy, so that archaeology per se is not the right academic discipline to be presumed in charge of analyzing the function of ancient megalithic sites, petroglyphs, or cave paintings. Systematic analysis of the ancient sites of mankind's heritage demands an understanding of the subject under examination. An academic trained and skilled in digging up pots has no rightful claim to expertise in understanding astronomical survey sites of antiquity. One of the major sites deciphered by this author is a map of the heavens on Earth in the case of the prehistoric rock drawings viz. petroglyphs of Tanum, Sweden. We call our presentation "the decipherment of the megaliths". The term "explanation" might be a better, if also less effective word. You can access our pages through the geographic links in the left column or at the bottom of this text or at the top of this page. 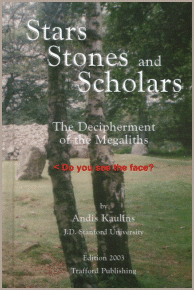 If you prefer the printed word, you also have the option to buy our book on the megaliths at Stars Stones and Scholars: The Decipherment of the Megaliths (see Science Book Review for review). The text material below is intended as an introduction to materials on this website. We think that your understanding of our pages will be increased if you continue reading this page, but that is up to you. You can always come back to this page later through the "home" link above. The world's megalithic sites are a source of controversial mystery to science. No mainstream discipline has ever engaged in a systematic study of the world's megalithic sites. Quite the contrary, pioneer scholars such as the late Gerald S. Hawkins, who wrote the groundbreaking Stonehenge Decoded, have often been ignored by the establishment. Hawkins himself related the tale of a British government official who simply rejected his findings without reading them by stating that "the ancient Britons couldn't have been as clever as all that". In fact, the megalith builders are still more or less an "unknown" quantity, an uncertainty which leads most archaeologists and most mainstream scholars to avoid megalithic study altogether. But how can this worldwide heritage be ignored and ancient history be accurately written without accounting for megaliths and megalithic sites? Who erected them, and why? Mainstream science does not know. We claim to have a part of the answer. "The name Hermes appears to have originated in the word for "stone heap." Probably since prehistoric times there existed in Crete and in other Greek regions a custom of erecting a herma or hermaion consisting of an upright stone surrounded at its base by a heap of smaller stones. Such monuments were used to serve as boundaries or as landmarks for wayfarers." This hermetic tradition contradicts the prevailing but unsupportable mainstream view that the original purpose of megalithic sites was to serve as tombs, for which there is little probative evidence. Rather, we know that the ancients often transported huge stones many miles to erect them at a particular location far removed from their origin. Obviously, these sites were not tombs, as it would have been far simpler to transport the deceased to the area of rock quarries, rather than vice versa. Obviously, the sites chosen for megaliths had a special significance. If the original Neolithic megaliths and megalithic sites were boundaries and landmarks, how were the locations selected and surveyed? One of the cardinal precepts of the Hermetic tradition is "As above, so below". In days before writing and the invention of printed maps, one could not simply go down to the local store and buy travel maps, and yet, people had to be able to get around on land and to navigate by sea. How did they do it? How did they know where they were? 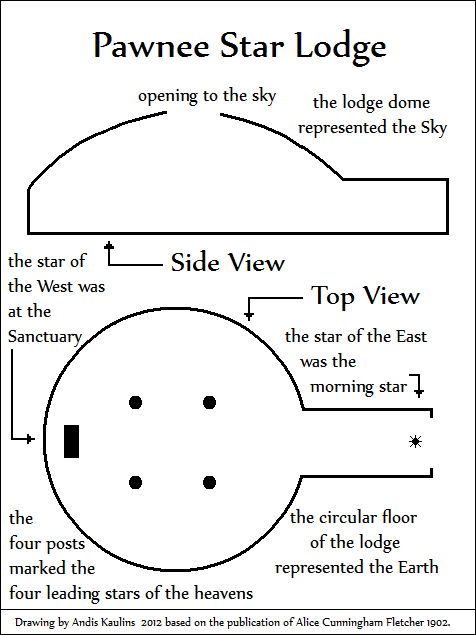 We claim, and all available evidence points in this direction, that the ancients took a "fixed known map" - this was the map of the heaven of stars - and projected that map onto the Earth - as a model for land survey. Anyone having knowledge of the heavenly stars could thus find his way around on Earth by means of the megaliths, which served both as boundaries and landmarks, sighted (and sited) by astronomy. "Alice Fletcher documents the astrological symbols of an American Indian culture.... She notes the historical diffusion of beliefs and rituals throughout American trade and pilgrimage routes. Fletcher focuses on the Pawnee perception of the stars and its effects on village planning and indigenous mythology. Up until the late nineteenth century the Pawnee inhabited the Platte River in what is now the Midwestern state of Nebraska.... Fletcher investigates the Skidi Pawnee clan who portray astrological themes in village construction. Skidi comprise five functioning villages, each containing ritual icons for the worship of certain constellations. Each village took on characteristics of certain star systems, and ceremonies were initiated to celebrate the astronomical rhythm of favorite constellations. The geographic location of five Skidi villages in relation to one another corresponded respectively to the constellations to which they were symbolically attached.... Fletcher explains how the earth lodge abodes that the Pawnee build are based on constellation patterns.... The Pawnee transform observation of stellar patterns into village planning, hut construction, and religion. These tribes had an intensive ritual life that took place at shrines dedicated to the night sky over the flatlands." That in a nutshell, corresponds pretty well to the megalithic system we have discovered. As we show e.g. in our book on the megaliths, each temple of Malta has a form which corresponds to a different stellar constellation, and all of the temples of Malta fit into a cohesive astronomical geodetic system. This, we allege, was an ancient survey system globally applied. For example, Gaelic tradition states that heavenly locations had earthly counterparts, although this knowledge is now submerged in Gaelic myth and is no longer directly accessible. The only way left for us to reconstruct such ancient hermetic systems is to examine the megalithic sites themselves and to research if these sites are systematically located by the stars. Scotland, England and Wales, Ireland, France, Germany, Benelux (Belgium, the Netherlands, Luxembourg), Spain and Portugal (Iberia), Italy together with Corsica, Sardinia and Malta, the Baltic (Latvia, Lithuania and Estonia), Scandinavia (Norway, Sweden, Denmark, Finland, Iceland), Western Europe for countries not specifically listed above (such as Austria and Switzerland), Russia, Eastern Europe, Azerbaijan, Caucasus, North America (United States, Canada), Mesoamerica (Central America), South America, Oceania (including Polynesia, Micronesia, and New Zealand) and Australia, Ancient Greece (including Mediterranean islands such as Crete and Rhodes), Anatolia (Turkey), the Ancient Near East (Mesopotamia, Fertile Crescent, the Holy Land, Israel, Arabia, Persia, Assyria, Sumer, Akkad, lands of the Hittites), Africa and Egypt including Pharaonic Civilization, China, Japan, Korea, Southeast Asia (including Thailand), India and Sri Lanka, formerly Ceylon. Megaliths ("giant standing stones", menhirs) and related constructions such as cairns and dolmens (chambers of stone), tumuli and barrows (ancient earthworks) and henges and circles were built by ancient man for purposes of Astronomy and Geodetics. Stated simply, stars were used to measure the Earth and vice versa. This human achievement dates to the Neolithic Period (Stone Age), long before such technology was thought possible by modern scholars. Indeed, the observational astronomical tradition upon which the megaliths are based is likely to be many thousands of years older than the megaliths themselves. As discovered by Andis Kaulins, Neolithic megalithic sites are astronomy in a cohesive broadly based geodetic survey system. Megalithic sites marked geographic land borders as triangulated by astronomy, e.g. in Scotland, England and Wales, and Ireland, much as the kudurri (border stones) of Mesopotamia. In modern times, triangulation cornerstones have been put underground. In ancient days, these stones were erected on the surface - and there most of them have remained to this day. We can relate to this quite well by experience, having worked as a student out in the field for a summer for the Nebraska State Surveyor's Office. All Neolithic sites in Scotland listed in the Ordnance Survey map of Ancient Britain (ISBN 0-319-29028-X) form a planisphere (sky map) of the northern and southern heavens with a center at BALNUARAN of CLAVA, where BAL surely means POLE, while NUARAN surely was an ancient name for the "River of Light" (Heaven) as in Hebrew NEHAR DI NUR and Arabic NAHR. See Richard Hinckley Allen, Star Names, Dover (ISBN 0-486-21079-0). See my review of that book. The decipherment began at Clava. All Neolithic sites in England marked on the Ordnance Survey map of Ancient Britain, including megaliths, quoits, tumuli and barrows form a map projection of the stars of the northern and southern heavens, with the center of the system at the Herefordshire Beacon and Midsummer Hill. Sites later than the Neolithic period show that the ancients adjusted for precession. The site called The Hurlers in Cornwall is a location at which precession was calculated in Ancient Britain. Megaliths and megalithic sites in Ireland were selected and organized by region. The counties of modern Ireland and Northern Ireland - to the degree they approximate ancient regional boundaries - correspond to the stellar constellations of the heavens. Standing stones, menhirs, tumuli, barrows, cairns, quoits, dolmens, and selected swallets and caves mark the stars of the heavens in Ancient Britain. Many megaliths are carved with reliefs of interlocking figures (smaller figures drawn within larger figures) which identify the stars to which stones are oriented (this Neolithic artistic style compares to modern works of M.C. Escher). Although our decipherment formally "began" at Balnuaran of Clava in Scotland through the cupmarked stones at that site, the megaliths at Wayland's Smithy e.g. were among the first stones solved, based on the carved (sculpted) shape of the stones themselves as well as through carvings on the stones and holes in the stones marking stars. This paved the way for the rest of the megaliths and for carvings found on ceremonial objects placed in swallets or hewn on the walls of caves. Weathering has of course made it harder to identify holes and figures - but erosive processes also work on the contours of reliefs, holes and cupmarks, so that these in many cases do not disappear entirely, since they weather too and in some cases maintain their general near-original shape. Using modern graphics software and the numerous tools available for microscopic analysis of photographs, most of these sculpted figures, indentations and markings on megaliths, cairns, stones and dolmens can be reconstructed, e.g. by redrawing only the heaviest visible lines or marks on the stones, or adjusting the brightness, color and contrast of pictures. This detective work allows the stars intended by the ancients to be identified in many cases. What is referred to here is not known, for although the figure represented is that of the Southern Cross this constellation always is upright when on the meridian, and, as the observation was made in latitude 14° or 15°, its base star was plainly visible." Megalithic boundaries mark both small and large geographic areas. For example, Counties in Scotland still retain elements of the approximate size, shape, and location of their comparable stellar constellations, located on earth by megaliths. Perthshire in Scotland e.g. retains the name PERSeus in PERTH. Megalithic sites in Perthshire such as Fowlis Wester represent stars in Perseus. The relative size and shape of Perthshire corresponds to the comparable constellation. Other counties are similar, though of course changed somewhat over the millennia. 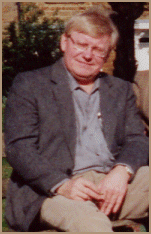 The graphic below shows the author at Fowlis Wester in the year 2001. The lines and dots have been added to the photo (not to the megalith) by the author to show how the stars of Perseus are represented by cupmarks on the stone, which shows the side profile, back and shoulder of a woman who has turned her head toward the viewer. The triangle of three large points to the left below Perseus of course marks the stars of Taurus. The shoulder marks the stars of the Pleiades for the reason that e.g. Plecs means "shoulder" in Indo-European language, e.g. Latvian. This analysis is supported for Fowlis Wester by Manx Gaelic Yn Whing as the name for Perseus, where whing in Manx Gaelic means "span, arm". On the European continent, each region had their own geodetic survey. In Germany astronomical works of the Magdalenians (later called Franks or Franken), were passed down as the legendary Ring of the Nibelungen, living on the Neckar (Nahr). Tumuli (Hügelgräber), megaliths throughout Germany, and the Felsenmeer between Frankfurt and Heidelberg are clearly ancient astronomical geodetic markers. 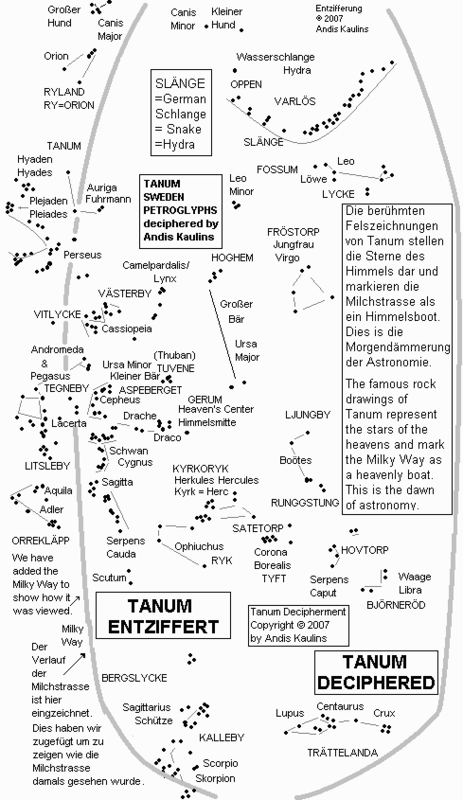 The Externsteine were a center of astronomical activity. The Gollenstein (Gollen Stone) at Blieskastel in Germany near Saarbrücken is the largest megalith in Middle Europe (7.6 meters high of which 6.6 meters are above the ground). As we have discovered, this megalith represents Hydra, the "longest" stellar constellation. Megaliths extend outward from the Gollen Stone and these megaliths surely marked the ancient border to France. In France, the cave paintings, and the stones at Carnac and elsewhere are ALL astronomical geodetic monuments. Mediterranean islands also have megaliths, such as the stone Sa Perda Pinta from Boeli [pole] near Mamoiada which we find marked a center of heaven for Sardinia in ancient days (so our discovery). Geographic locations of megaliths were intentionally oriented to the stars and to objects of the heavens in a given era. For Neolithic sites, the cardinal date seems to be either the Summer or Winter Solstice in 3117 BC (-3116 by astronomy) (as calculated by Starry Night Pro, ISBN 1-894395-01-8). Our initial view was that the Winter Solstice in 3117 BC was marked by a solar eclipse with Mars and Saturn at Spica in Virgo, and the rest of the visible planets at the Winter Solstice point. This unique phenomenon would have been well suited to start the first long-term human calendar - retained in e.g. Hindu and Maya calendration. However, due to the problems involved in calculating Delta T (the change in the rate of the spin of the earth over the millennia) as well as similar problems in determining the lunar acceleration parameter, solar eclipse data in ancient eras is subject to great dispute, and we are in the process of preparing a special page on ancient solar eclipses. The following links can now be used to navigate this website from this page. This page was last updated on August 18, 2018.